Despite the strong recovery in global equities, yields have continued to fall at a very fast pace, which clearly raises doubts over the healthiness of the recovery. The divergence between leading indicators (Dr.) Copper and AUDUSD persists, implying that the recent Chinese stimulus has clearly not convinced the market that we are experiencing a 2016 reflation trade. 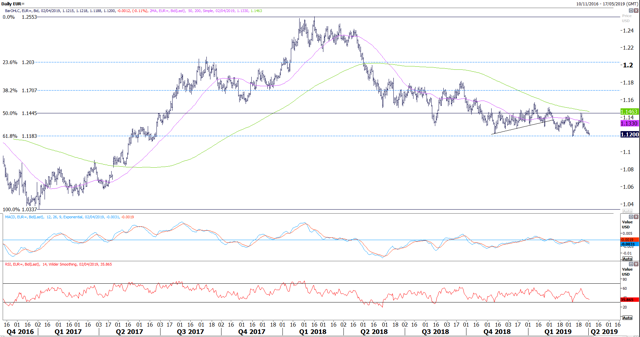 The euro looks vulnerable in the short run to a rise in risk-off sentiment or to a little peripheral bonds sell-off. Global: The inversion of the yield curve has usually scared investors of a potential recession coming ahead within the next 18 to 24 months. Despite the strong recovery in global equities, with the MSCI World Index recording its strongest quarter since Q3 2010 (up almost 12% in Q1), yields have continued to fall at a very fast pace, which clearly raises doubts over the healthiness of the recovery. Figure 1 (left frame) shows that net shorts on the VIX have constantly been increasing in the past few weeks and are now back at levels observed in late September. Once again, it seems that the surge in price volatility we observed at the end of 2018 was taken as an opportunity to short it and capture a premium for a lot of market participants. The divergence between leading indicators (Dr.) Copper and AUDUSD persists, implying that the recent Chinese stimulus has clearly not convinced the market that we are experiencing a 2016 reflation trade. The Aussie, which tends to react positively to liquidity injections from China, has been fairly flat since the beginning of the year. In addition, excess liquidity in China has continued to decrease while leading economic indicators have not shown any signs of positive momentum. Euro: As we wrote in a recent piece lately, the fact that the single currency has not reacted to the switch in US policymakers’ tone changed our short-term view on EURUSD. The fall of the real rate of interest in the euro area coupled with the disappointing macro data recently (i.e. German manufacturing PMI came in at 44.1 in March, lower than initially reported) will make it difficult for the euro to appreciate significantly. The single currency looks vulnerable in the short run to a rise in risk-off sentiment or to a little peripheral bonds sell-off. UK: The UK parliament struggles to find any alternative Brexit options; we saw that the four votes of House of Commons (Customs unions, common market, referendum on Brexit and emergency brake on no deal) were rejected, however numbers on the vote have started to narrow implying that we are getting close to an agreement. As long as political uncertainty around the outcome persists, the Bank of England is ‘forced’ to keep status quo on the monetary policy, leaving little room in case of another economic downturn in the futures. Net shorts on US Treasuries have remained stable in the week ending March 26th according to the CFTC. Demand for the ‘safe-haven’ US paper has eased after falling dramatically in the last two weeks of March; the 10Y dropped from 2.61% on March 19th to 2.37% on March 27th, its lowest level since December 2017, despite equities trading above the 2,800 level. EURUSD: As we mentioned in our macro session, the euro looks vulnerable in the short run. EURUSD is approaching its support at 1.1185 (the 61.8% Fibo retracement of the 1.0340–1.2550 range), which could be broken this time. Next strong support stands at the 1.10 psychological level. GBPUSD: Cable keeps responding to the on-going news on Brexit negotiation, and struggles to break through the 1.34 level. 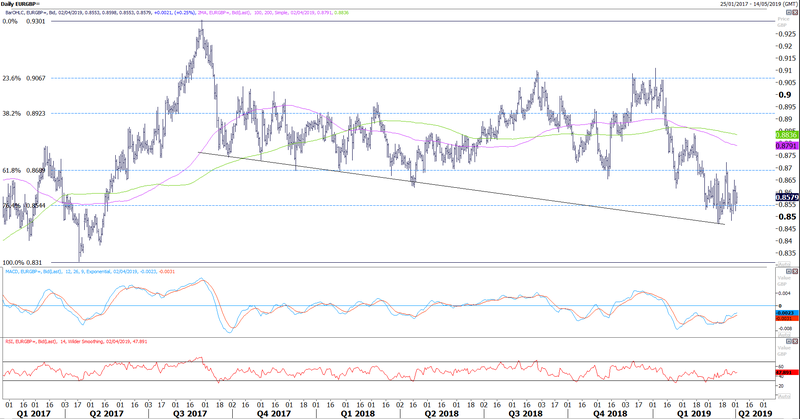 The pair is down more than 3 figures in the past few weeks and is on its way to test its short-term support zone at 1.29–1.2920 (61.8% Fibo retracement 1.20–1.4340 and 100D SMA). It may find some support below that level in case of positive sentiment. EURGBP: The pair is still trading around 0.8550, its 76.4% Fibo retracement of the 0.8310–0.93 range. We manage to take profit on our ST long trade idea at 0.86; however, we think that EURGBP may hit new lows in the short run in case the euro breaks the 1.1185 support against the greenback. 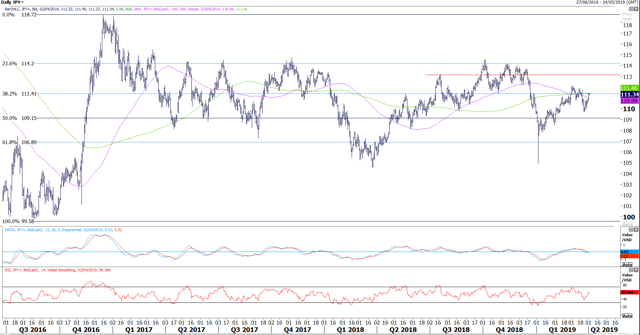 USDJPY: The yen got sold aggressively on the back of a rise in risk appetite, driving equities and bond yields higher. We are still short the pair against a sudden significant sell-off, as the lack of momentum in the Aussie raises doubt about the bullishness in the market. However, we think that USDJPY will be sensitive to US 10Y Yields, therefore a higher 10Y will push up the pair. 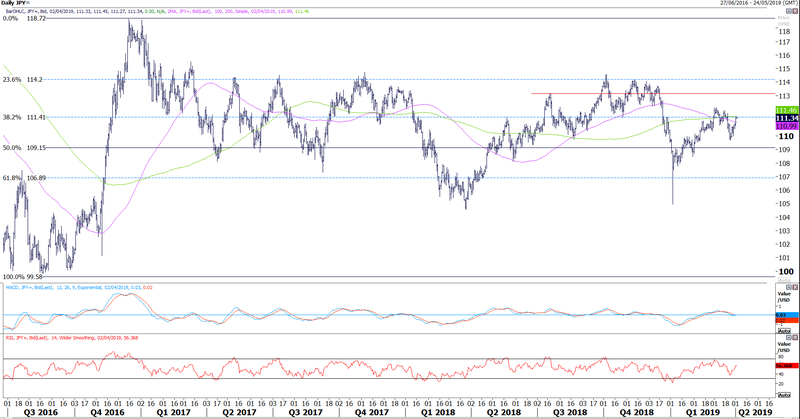 USDCHF: The pair did not manage to break through its 0.9920 and is now trading back to parity. We are waiting for higher levels to start shorting again, hence we will try to short some at 1.0080. One of the charts we like to follow is the impact of excess liquidity (defined as the difference between real M1 money growth and industrial production) on asset prices such as equities or housing for instance. For most advanced economies, a decrease in excess liquidity is negative for the financial economy and tends to lead (9 months) equities’ performance. 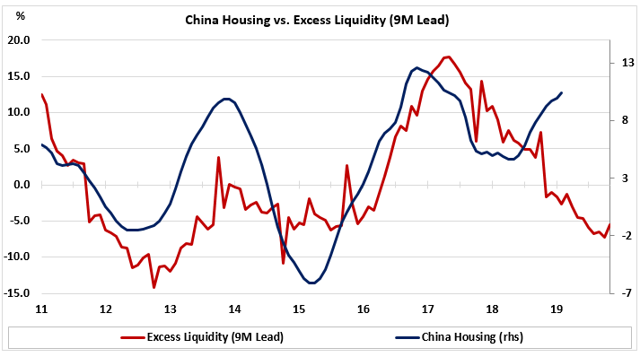 However, we observe an interesting divergence in China, where the excess liquidity has been falling from 6% to -5.5% in the past 12 months (as a result of collapsing real M1), while house prices have been rising by 5% to 10.4% YoY. China’s property market is estimated to account for 15% of the country’s GDP, and a contraction in house prices will definitely be reflected in the output. Hence, officials in China are closely following the dynamics of the housing market in order to preserve their ‘precious’ 6%+ real growth in the following quarters. How long can the divergence persist? Disclosure: I am/we are short USDJPY. I wrote this article myself, and it expresses my own opinions. I am not receiving compensation for it (other than from Seeking Alpha). I have no business relationship with any company whose stock is mentioned in this article.